Today I am bringing some BOOMCHICKAPOP to Game Day..
Did you know that Super Bowl Sunday is the second highest event in America for most food consumption — following Thanksgiving? Yup, it's a fact guys. So it is kinda funny to me that most people spend weeks planning their Thanksgiving Day menu, days shopping and cooking and yet for Super Bowl Sunday, most of us stroll through the grocery store, toss a few things in our cart and call it a day. 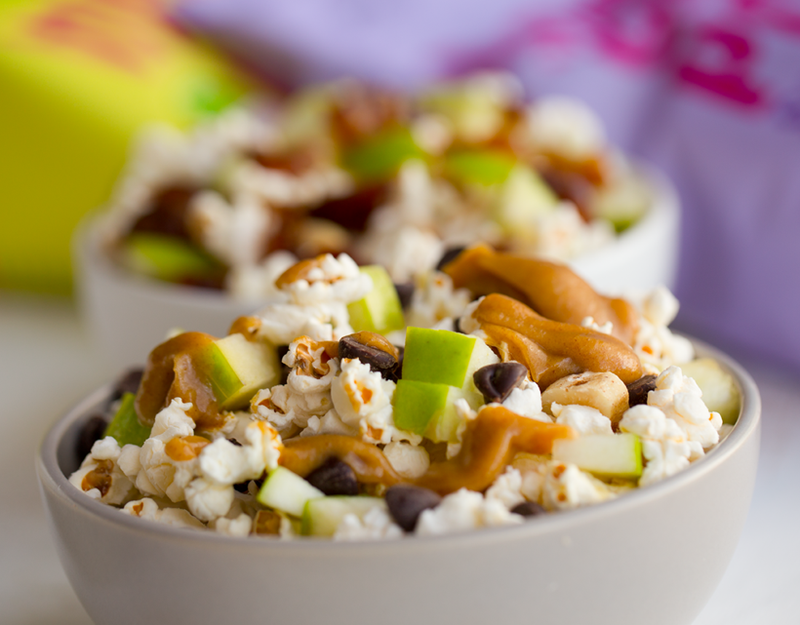 Well this year, add some fun and deliciousness to your Game Day menu by making popcorn mix-in snack bowls!.. 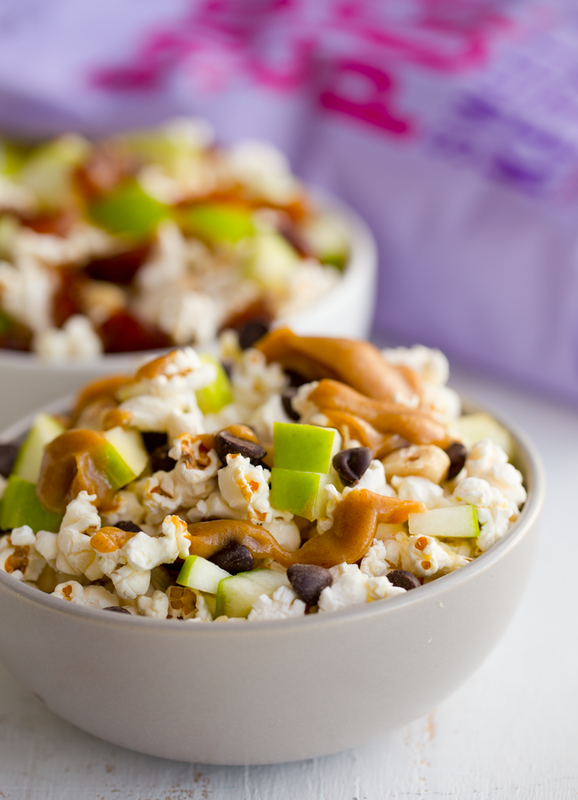 Today's creation features Peanut Caramel Apple Popcorn Snack Bowls. Plus enter my giveaway to win a $50 Amazon gift card for all your Game Day goodies! Planning for that big Game Day. Bagged snacks are go-to purchases for Super Bowl Sunday because they are fast, easy and if you do not end up using all the bags you bought, you just store them and save for later. But those traditional bagged goodies are often loaded with calories, fat, cholesterol, not a lot of fiber, artificial flavors and colors and more. Well for snacking, I LOVE POPCORN. Love it. Popcorn is packed with fiber - it is a whole grain! - so you can nibble away and actually start to feel satiated. Unlike potato chips which you could pretty much inhale without satisfaction. 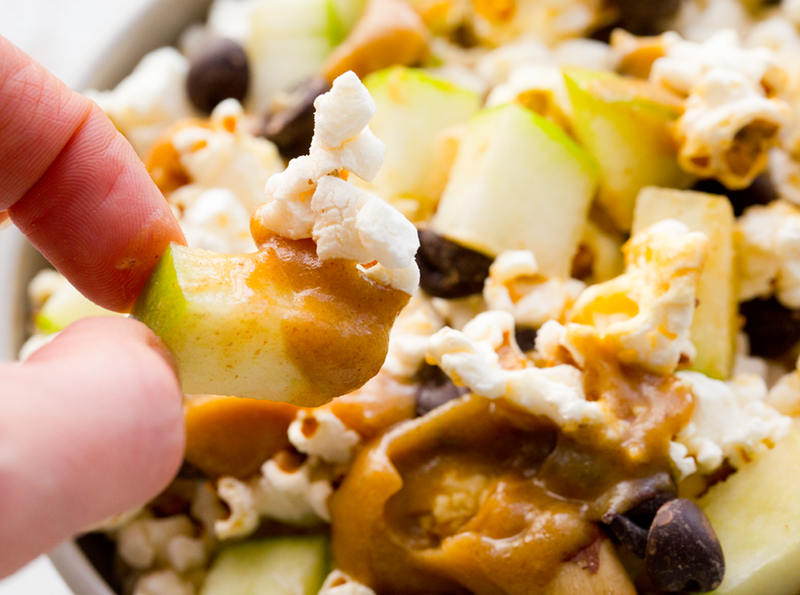 Plus, popcorn is perfect for adding goodies to. Mix-in fun! And sure, you could pop your own popcorn at home. 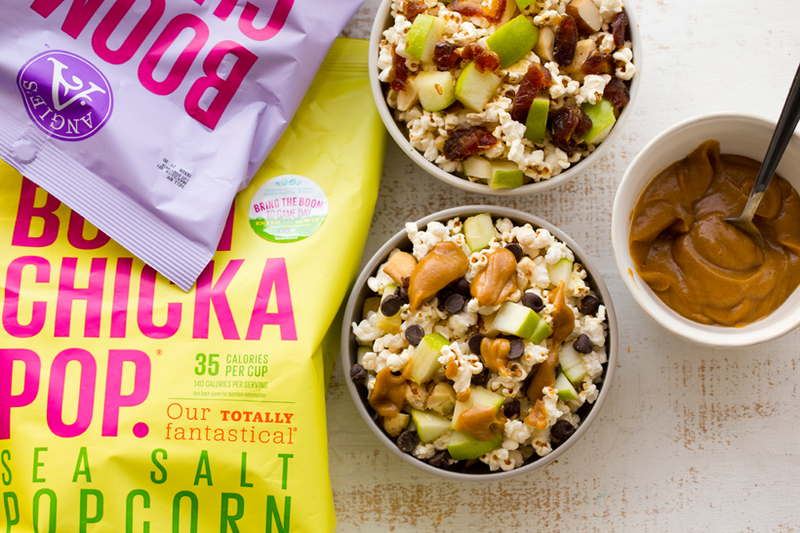 But BOOMCHICKAPOP makes it so easy to have a go-to, delicious, feel-good snack ready to go! One less thing to do. And all you have to worry about is adding the fun. Aka, mix-ins..
DIY Snack Time. Create your own "popcorn mix-ins" bar. Try the goodies I suggested in my bowls (apples, peanuts, caramel or dates..) or experiment with your own healthy nibbles. 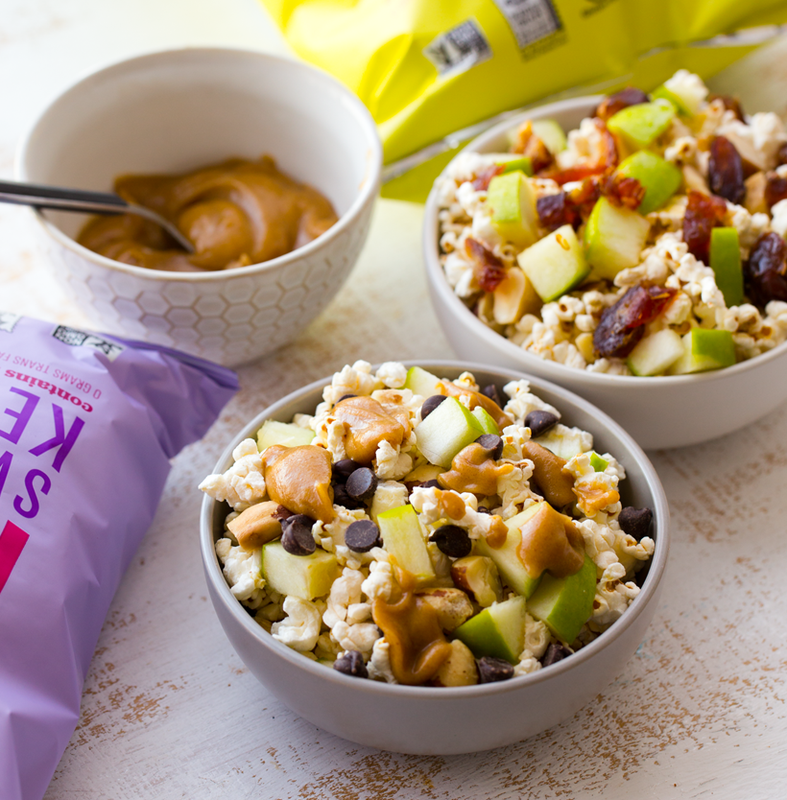 Add a bunch of mix-in options and let your guests create their own snack bowls! - what else do you love to add?? Get a sticky sweet accent by adding either sliced Medjool dates, or DIY caramel..
Medjool date caramel makes a perfect popcorn topping! Or try melted nut butter or melted chocolate. Or all three!.. This sticky sweet topping wiggles into all the nooks and crannies of the BOOMCHICKAPOP and is SO GOOD. ..another fun tip is to make these bowls then FREEZE THEM! No, really, I tried it. 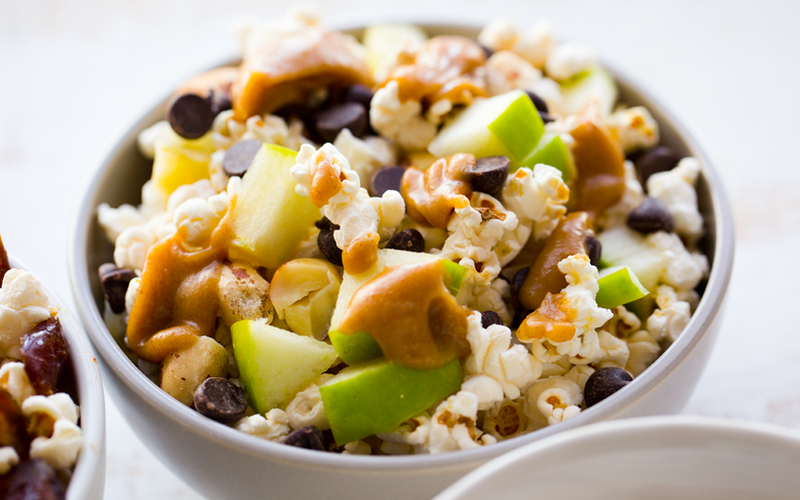 The caramel hardens into a sticky-chewy texture around the popcorn like crumbled popcorn balls. YUM. Game Day, Schmame Day? Truth be told, I know a lot of you guys (raises hand) just want to watch the half time show, scan a few commercials, make and eat fun snacks and tune out the actual game playing. Sorry football. But yes to snacks. see, we still love you Game Day. Giveaway. Need a budget for buying mix-ins for your popcorn?.. 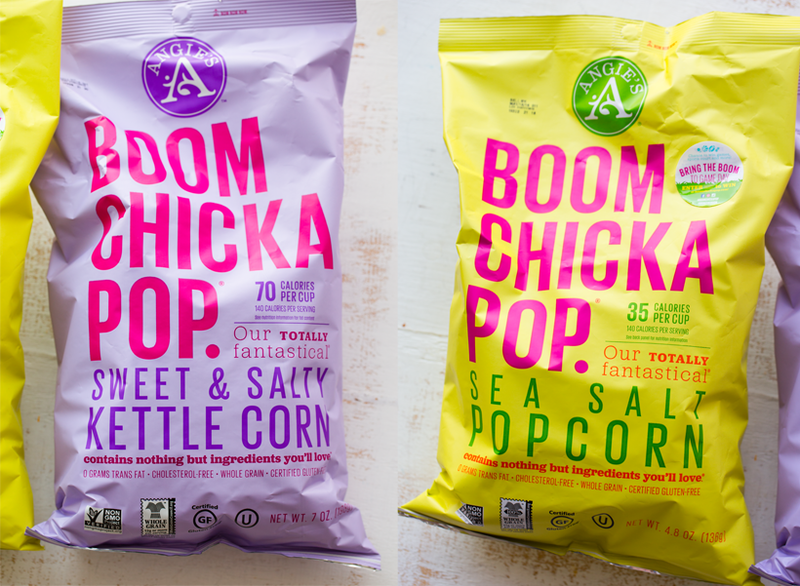 I love BOOMCHICKAPOP because it is certified gluten­-free and uses non-­GMO ingredients in all their products. And most of the products are vegan - and say so on the packaging. Yay. I am a huge fan of the Sea Salt and Lightly Sweet flavors. And I am dying to try the Sweet and Spicy and Sea Salt and Vinegar flavors! The flavors start at just 35 calories per cup, compare that to around 140 calories in a cup of potato chips! So dive in! BOOMCHICKAPOP is great-­tasting, fun and keeps it simple with only a handful of ingredients per bag with nothing artificial. bring the BOOM to snack time.. 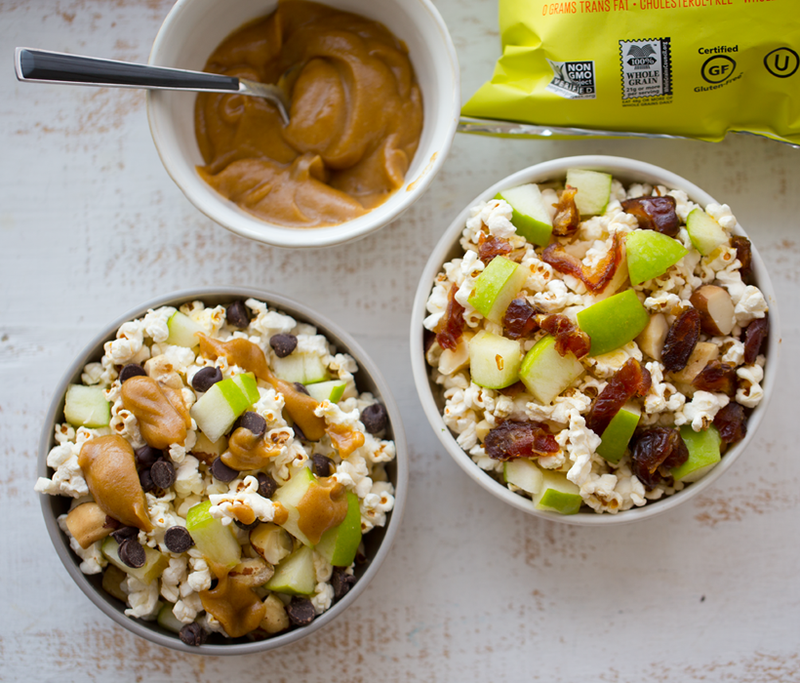 Pop corn mix-ins using caramel apple flavors! Toss everything together! 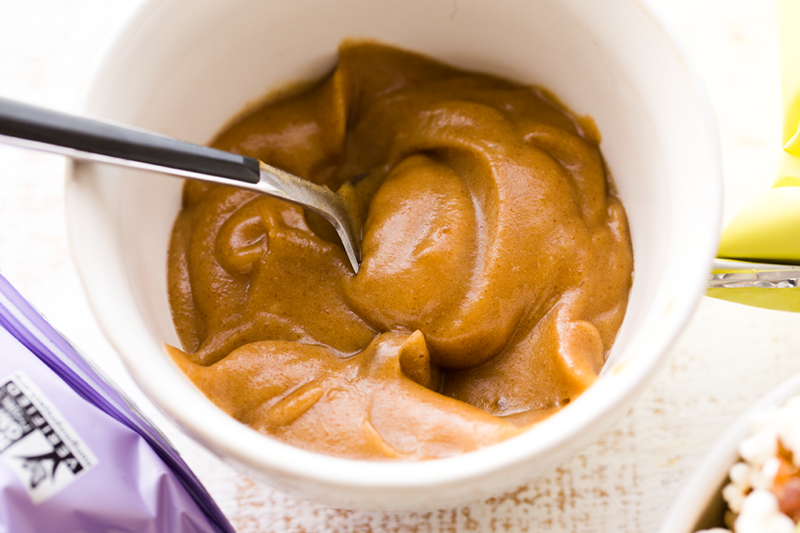 If using the peanut butter or date caramel, just drizzle it on top. Tip! You can even serve this chilled! 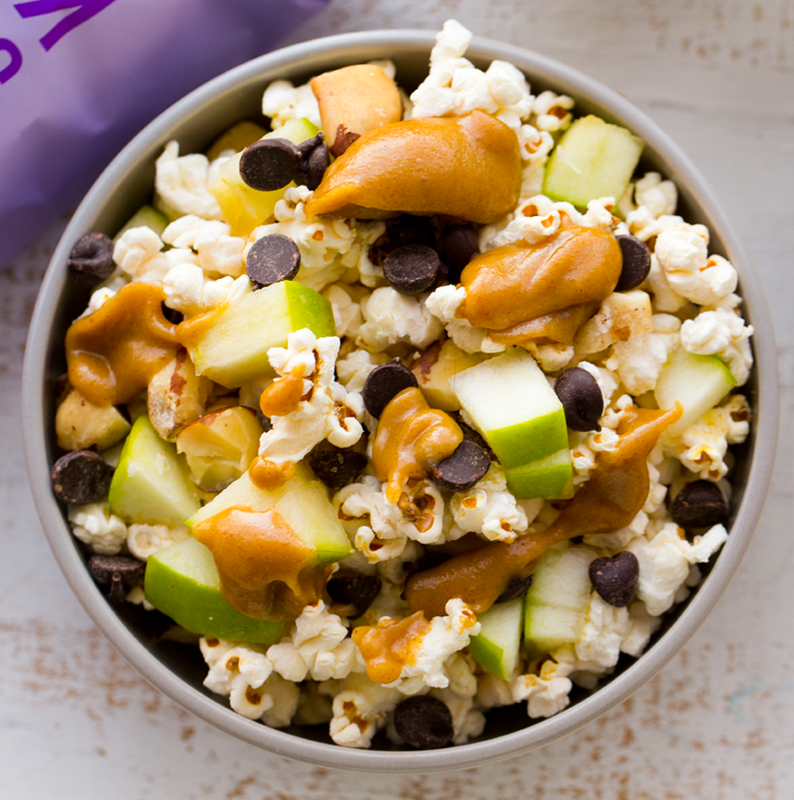 When the caramel cools mixed with the popcorn, it becomes like a broken up popcorn ball! Enter to WIN. Enter the Bring the Boom to Game Day contest for a chance to win one of five Game Day Kits from BOOMCHICKAPOP! Each Game Day Kit contains: A PINK Angie’s grill (perfect for some #vegan grilling! ), Grilling Utensils, Pink Travel Chair. Contest ends: 2/10/16 - 5 Winners Picked: 2/11/16 -- To enter, simply click over to the BOOMCHICKAPOP website for inspiration, then create and share a photo of how you Bring the BOOM to Game Day across Instagram, Facebook, Pinterest, or Twitter using the campaign hashtag #BringtheBOOM. Five winners will be randomly chosen. Also enter my giveaway at top! And one more contest!..Also enter the Bring the Boom to Game Day Sweepstakes -- details on the BOOMCHICKAPOP website. And their website is super cute too. Such fun branding! Bright colors, smart and sassy flavors and all natural values. I'm a fan.